In case you have not yet heard, Bing’s Search Share Grew in February and their Market Share was up for the Third Straight Month in a row. The 4% to 6% month over month growth in search traffic is pulling Bing an estimated search share of somewhere between 9% and 12% of all total monthly US searches. Yea, that’s right. I said the Wetlands. You may not understand it, but i’m right! So, what kind of Alaska Content is there anyway? Notice how I didn’t even mention Search content? That’s because interesting content comes in many different forms. In case you may have forgotten, Yahoo and AOL both turned free email into dominant search market shares in the good old days. Well, I suppose email and other content. Still unconvinced? Here is my truth. I have been drawn to Bing.com lately. In particular the daily interactive homepages. My interest started to rise during the Winter Olympics and has yet to drop. 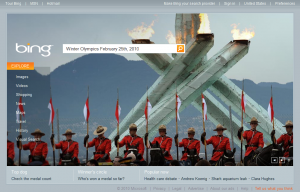 I’m actually finding my own interest in Bing, well, kind of interesting. You see, I’ve been in search engine marketing for a number of years and during all that time rarely have I ever used MSN.com or Live.com. In fact I have probably searched Microsoft’s new search engine more this year than I have in all my other years combined. Hummm… My searching habits have changed. Take today for instance. 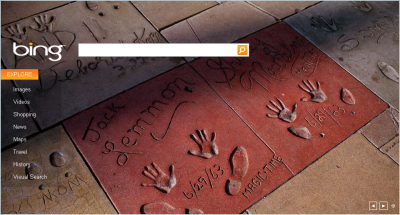 I visited Bing for no other reason than to see what the new photo was. It turns out that it is of wetland lakes near Anchorage, AK. Cool. I have a couple of good clients in Alaska. One provides Alaskan vacation packages state wide and another Alaskan wilderness lodging in Palmer, AK, only 40 miles from Anchorage. Since this page was relevant to me it was easy to spend a few minutes interacting with it. Guess what else happened? I searched. They did it. Drew me in and got me to search! Today wasn’t the only day that they provided a page I could connect with. Earlier in the week there was also the one of the hand and shoe prints in the cement courtyard of Grauman’s Chinese Theater in Hollywood. That one was on Sunday, the same day as the Oscars. Very timely and engaging. Now lets do some search query math. Let’s say that I averaged, maybe 20 to 40 original, non-rank-checking/non-client-research/non-serp-comparison searches per year on MSN.com and Live.com during my 10 years in search prior to the Bing search engine launch in May of 2009. Since I did not like the MSN portal, and Live would crash my desktop from time to time, I can honestly say that 20-40 is a good range for queries of original and unique intent. Lets average that at 30 per year. Even while counting search queries that predate MSN.com’s in-house search engine, that only adds up to about 300 searches before Bing. Now, for 2010, I would estimate my original Bing searches at 20-40 per month. Per month not per year. That’s roughly a 1,200% increase. It’s quite obvious that this is more than the actual increase that Microsoft has gained since Bing launched, but since Microsoft’s goal is to gain market share one point at a time, they are reaching that goal. So there you have it. 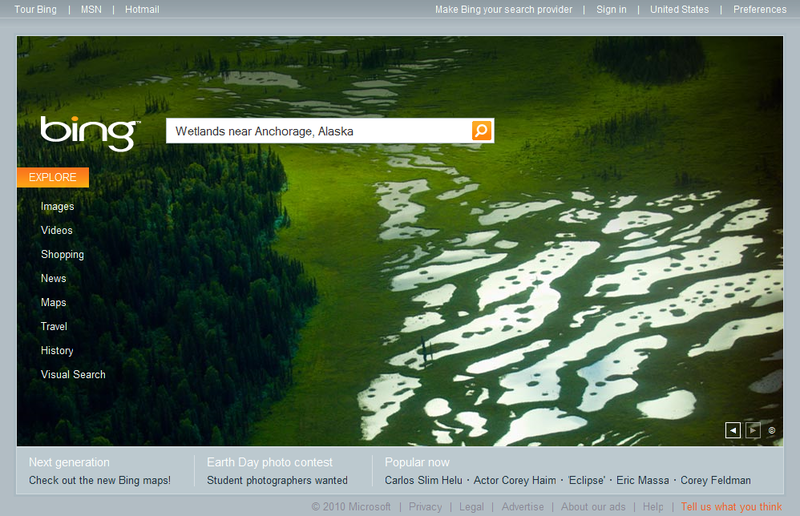 Bing search is growing and it’s all because of the Alaskan Wetlands! And now that one of Earth’s nature areas have been proven to help search, Al Gore and Ralph Nader have reason to rally Microsoft to their green crusade against global warming.